My name is Paul Nadolski, and I am a railfan/historian from Rockford, Illinois, on what was (1986-1997) Soo Line's ex-Milwaukee Road Janesville Sub. My first exposure to the Soo Line came in 1993, when my grandpa (1927-2012) was doing some excavating near Davis Junction, IL on what was (at the time) Soo's ex-Milwaukee Road line to Kansas City. There were a lot more trains then, before the UP-SP merger (and trackage rights on BNSF took the trains to Galesburg). Grandpa was a lifelong railfan (he grew up on the Illinois Central main line in Ashley, IL), and that summer, after telling me all about the Soo trains he would see every day, he gave me a gift of an HO scale model Soo Line GP38-2. I became a lifelong Soo Line guy immediately and started this page in the late 90s while a student at Augustana College in Rock Island, IL as a tribute to my favorite "fallen flag". I subsequently relocated to the Twin Cities after graduation, and stayed for eight years, from 2001-2009 (I left due to job loss). During that time, I never missed an opportunity to chase and photograph Soo Line trains. My primary interests are the steam/diesel transition era in Minnesota, and operations in "my backyard" (Illinois, Iowa, southern Wisconsin and Minnesota) after the Milwaukee Road merger. 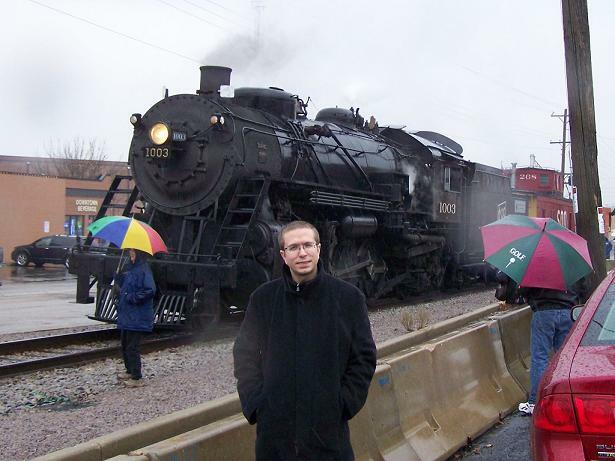 Since my first exposure, I've had the opportunity to ride behind both restored Soo steam locomotives, 2719 (Duluth, MN-including a cab ride!) and 1003 (Hartford, WI), as well as to photograph the Soo in Wisconsin, Minnesota and Illinois. In addition, I have followed many miles of Soo lines, extant and lifted; for the record, I have followed EVERY MILE the Soo ever operated in Minnesota and Illinois, and about 50% of the lines in Wisconsin! My goal is to follow every mile the Soo Line ever operated, including lines acquired in the Milwaukee merger. I have also built up a timetable collection, covering the entire Soo Line, as well as employee and public timetables of many other railroads, starting in 2009. I have published them here as a resource because this information is so valuable and hard to find, and I am happy to share. Regrettably, I am unable to accept email; due to a high incidence of spammers, I no longer publish my email address here. For those with questions about the Soo Line, I suggest contacting the Soo Line Historical and Technical Society, or joining the Soo Line History Yahoo! Group. While discussion on the latter forum tends to be mostly Wisconsin-centric, it is a good place to ask questions about the Soo overall. ). I love Italian cuisine, travel, and am a staunch supporter of the Minnesota Twins, University of Minnesota Golden Gophers, Toronto Maple Leafs, and Seattle Sounders FC. I also maintain a Tumblr blog where I publish more pictures I have taken of trains. Thanks for visiting and I hope you enjoy Soo Line Online! 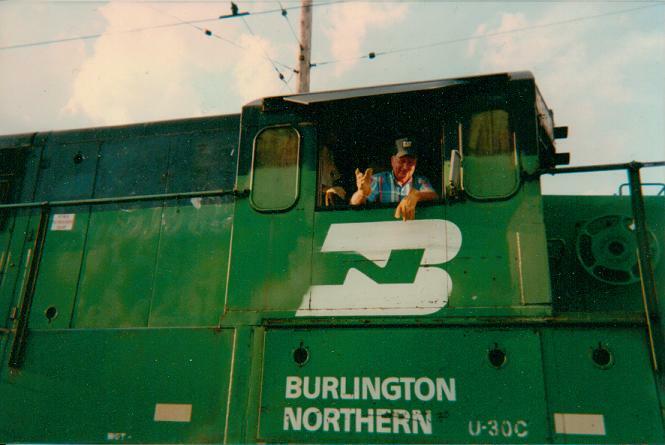 Pictured below: me with Soo Line 1003 in a pouring rain, November 2010, and Grandpa in the cab of Burlington Northern U30C 5383 at Illinois Railway Museum, July 1996.